None of us has the option to stand still when the world around us is moving so fast. Of the ideas that were most striking to me, three stand out – not that I have answers to any of the questions they raise, mind you, but I think they are among the central points that the leaders of today and the aspiring leaders of tomorrow must be prepared to address. Do we have the courage to slow down in favor of deeper insight? Early in the book, Daly shares some staggering statistics on the growth of data. The numbers quickly escalate to a scale where they sound imaginary. But despite their scale, the impact of each discreet unit has actually decreased. Think back to the Gutenberg Bible, published in the mid-15th century. Although there were a relatively small number of these books made, and only 49 authenticated copies survive today, the sheer impact of each copy in its day extended far beyond today’s 4.4 zeta bytes of digital data. As a writer, Daly addresses one of my fears head on – the sheer volume of content being produced and shared today makes it nearly impossible for anyone to keep up. So who are we writing for? If we could each scale back the volume of our data footprint while simultaneously increasing the scale of our impact, would we do it – or would the fear of being lost in the noise be too much to overcome? Who will be the ‘robot master’? Daly talks about the role of human programmers in several chapters of the book, and the range of perspectives provides ample food for thought. Investments in user experience mean that we don’t have to understand how our technology works, and yet it must be ‘taught’ by someone. But who? Daly also points out that humans have a natural bias towards consuming information that confirms the opinions and positions we already hold. If we bring these two ideas together, the role of programmer/teacher is clearly critical – a position of high power and influence in the AI world. The risks that must be overcome include closing machines off to learning new ways simply because humans can not yet conceive of them, and unintentionally embedding our own biases into the very systems we look to for innovation and change. And finally, since none of these ideas can be fixed, I appreciated the section where Daly compared the changes to his own definition of AI over time (on p. 10). His two primary alterations – both of which hold a great deal of cross-functional meaning – are the addition of time savings to the value proposition of AI (formerly it was only cost savings) and the assertion that the knowledge encapsulated in AI must be available and consumable, but also actionable. As definitions such as this one evolve to incorporate the scarce resources of the time, I have to wonder what the next ‘currency’ would be to join money and time. 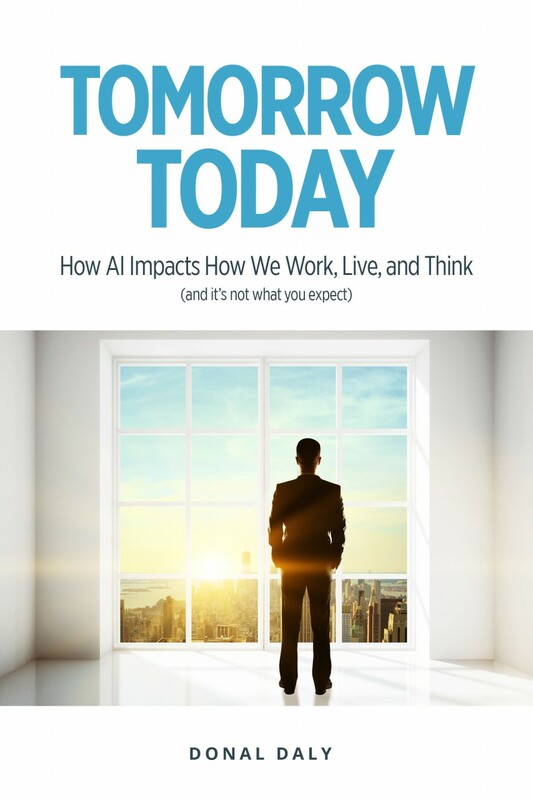 I enthusiastically recommend this book to anyone – regardless of title or job function – that is willing to embrace change and explore the potential that is 'Tomorrow Today'.